Black Friday may be a few months away, but that doesn’t mean you can’t start scoping out those holiday deals and begin saving today. 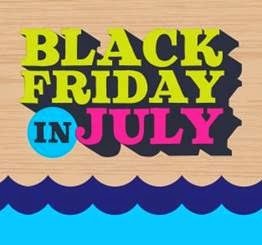 Head on over to Target.com on July 25th and 26th for their Black Friday in July sale, which ensures shoppers save both money and face with Spa Sonic’s Skin Care System and DermaLight deals. Designed for individuals who want a full spa experience at home or while traveling, Spa Sonic offers beauty devices that outperform competitors without the hefty price tag. Specially designed by dermatologists utilizing gentle, rotating bristles to offer a deeper clean without irritation, the Spa Sonic Skin Care System removes impurities, exfoliates, tightens and minimizes pores. This waterproof device operates with four attachments: a small brush for the face, a large brush for the body, a pumice pad for rough areas, and a facial sponge for microdermabrasion and reduction of fine lines; all of which are included. Available in white, lavender, pink, orchid, optic yellow and tangerine. Offering visible results in just a few weeks, DermaLight by Spa Sonic is an LED device that employs low-level light therapy technology to tighten skin, minimize pores and improve the appearance of fine lines and wrinkles. Non-invasive and non-thermal light energy permeates the skin’s dermal layers to promote cell growth and rapid absorption of skin care products. Compact and user-friendly, DermaLight allows consumers to manage their own treatments and touch ups at home or while traveling. UPDATE: I got to chance to review the Spa Sonic Skincare System. 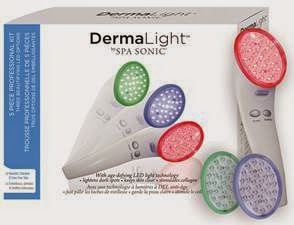 Have you tried Spa Sonic or DermaLight before? I have always wanted to try the sonic but just didnt have the guts before. Maybe I will give it a shot. Thanks for the review! I haven't tried it yet either but will be soon. Thanks for sharing Lisa! And thanks for nominating me!